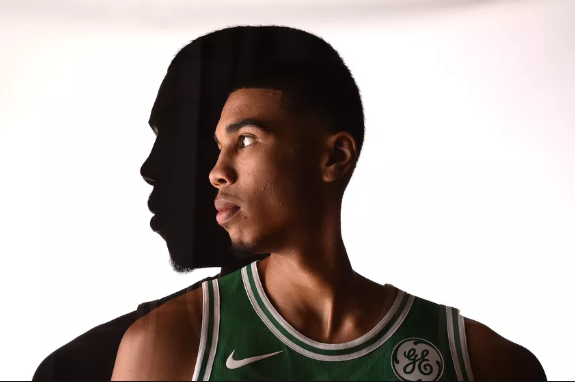 Where does Jayson Tatum rank as a power forward in the NBA? The idea of playing Jayson Tatum as a power forward is probably rubbing more than a few of you the wrong way, given how slight and short (for the position) he is - 6'8 in shoes and not even 210 pounds. But the NBA has changed a lot in that regard over the last five years, and fast, athletic combo wings able to switch on defense, and attack the cup as well as they can shoot from deep are the new style, and it has worked well for most teams going this route. To be sure, there's still teams with relatively immobile and even non-shooting fours, but there's not many left, and few held in high regard. But given this shift in power forward play and body, where does Jayson rank? In the eyes of Bleacher Report's Adam Fromal and Dan Favale, pretty high. They assembled a top-15 list of the best players by position around the league, and while position means less on the Boston Celtics than on some teams, Tatum will effectively be matching up with and functioning as a four this season, barring surprise changes. In these two writer's estimation, Jayson's talent places him as the fifth-best four in the NBA, and in his sophomore season, at that. The ten players behind him on the list are a mix of the old-style fours who are good enough at something to register a place in such a conversation (Julius Randle), are slowly aging out of star status (Blake Griffin, Paul Millsap), or are faulted but good players on the come up (Nikola Mirotic, OG Anunoby, Lauri Markkanen, Aaron Gordon, Thaddeus Young, Dario Saric, Tobias Harris). The players they rank above him? LaMarcus Aldridge, Kevin Love, Draymond Green, and Giannis Antetokounmpo. Keep in mind this isn't about what player you'd rather have on your team under contract for multiple years - just talent this coming season. If it were which player I'd prefer to have to build around, only Giannis would rank higher, and only by a little, based on "bird in hand" principles regarding Tatum's potential - I think he'll be as valuable or better of a player in a few more seasons, but Antetokounmpo has already hit MVP-candidate levels. Aldridge is, I suppose, a more effective scoring threat - or was last season, anyway - but has slowed considerably; I could see his numbers going up this season despite playing worse, just because of how barren the San Antonio Spurs roster has become. Similarly, Kevin Love may or may not regain some of his Minnesota Timberwolves-era luster as the Cleveland Cavaliers' sole remaining bonafide star, but I rank Tatum above both of these two when you take into consideration the diminished looks he'll likely get after Gordon Hayward is at full strength. The definition of a "power forward" has changed. Draymond has a case to remain the number two power forward in the league, but with age and balky knees threatening to curtail his season before it's even begun, it would not surprise me to see him start to slip by next year, if not sooner - I don't have too many complaints about this order. What do you think? Did these two nail Tatum's ranking? Too high? Low? Do they have him (Fromal and Favale - or Brad Stevens, for that matter) at the wrong position? If so, what should he be considered/playing? Let us know in the comments below.